Education and teachers are political footballs like no other. Politicians regularly stir up controversy about teachers’ daily working lives: their (excessive) wages; their (generous) holidays; their (misdirected) classroom focus. Parents, understandably anxious to get the best for their kids, are sometimes easy targets for ‘quick-fix’ plans. 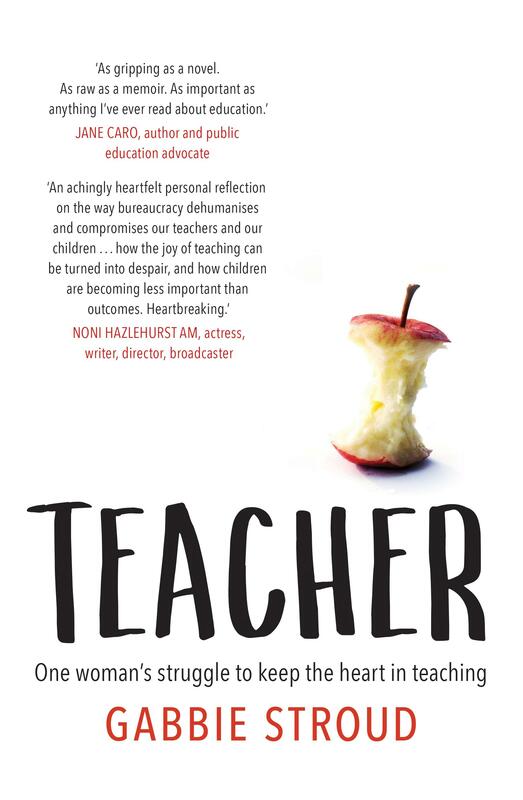 Gabbie Stroud’s Teacher plunges you straight into the working life of an Australian teacher. Stroud paints a vivid picture of the chaos, hilarity and occasional futility of a hardworking contemporary classroom at the mercy of a disconnected bureaucracy. The kids, as per usual, are a troubling riot. Stroud uses their antics to ask some big questions about what education is and what we might want it to be. Her reflections on her own upbringing and education, however, make this all more bittersweet than polemical. Stroud has to simultaneously extend engaged students, support struggling students and determine where on that broad spectrum the rest of her 30 students sit. She has to help all the students with special needs without enough Education Support staff. And just when she’s getting a handle on these issues, she has to watch some politician’s pronouncement on TV and realise all the solutions she’s come up with are not feasible anymore. It’s a maddening dilemma all teachers will be familiar with. Directives from above about mandatory standardised testing are an increasingly common and often completely pointless part of the teaching day. These farcical rituals can become a ‘last straw’ moment for many teachers already putting in extremely long hours. Stroud herself ultimately left teaching in frustration at the NAPLAN and My School regime. Teacher is an engaging and charming cautionary tale about where we’re headed as a society. If you’ve ever envied a teacher their holidays, this exposé will make you glad you chose a 9–5 job.